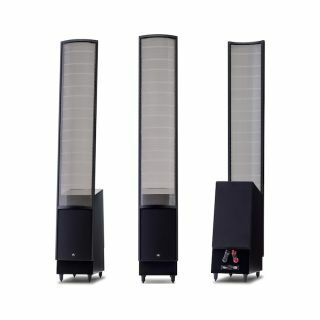 MartinLogan announces new high-end electrostatic speaker range | What Hi-Fi? The company's latest additions to its ElectroMotion and Masterpiece lines, the ElectroMotion ESL X and Renaissance ESL 15A, are available now, while the Expression ESL 13A and Impression ESL 11A are due out in mid-September. Priced at £4500 (£5300 for a gloss black version), MartinLogan has launched a new "entry-level" electrostatic speaker, the Electromotion ESL X. The ESL X features two 20cm dual woofers and components usually found in the company's (even) more expensive speakers, such as custom-wound transformers, air-core coils, and polyester and low DF electrolytic capacitors. The company has also announced the latest in its Masterpiece range, the Renaissance ESL 15A, which features a Curvilinear Line Source (CLS) XStat electrostatic transducer, which MartinLogan calls the "pièce de résistance" of the product. The speaker can control the interaction between the rear-firing woofer and its surroundings through "smart phase-shifting" technology, which the company says minimises the effect of bass sounds bouncing back into the room from furniture or walls. MartinLogan has also implemented Anthem Room Correction (ARC) functionality into this speaker, as well as into the cheaper Expression ESL 13A and Impression ESL 11A speakers, which will be available next month. ARC measures sound output from the speaker’s woofers and compares the resulting in-room response to an in-built standard, with the objective of attaining more “transparent, natural-sounding bass". However, there is also a bass level dial and mid/bass level switch if you want to decide for yourself. The Electromotion ESL X and Renaissance ESL 15A (£25,000 per pair) are available exclusively now, while the Expression ESL 13A (£15,000 per pair) and Impression ESL 11A (£10,000 per pair) speakers will be available in September.